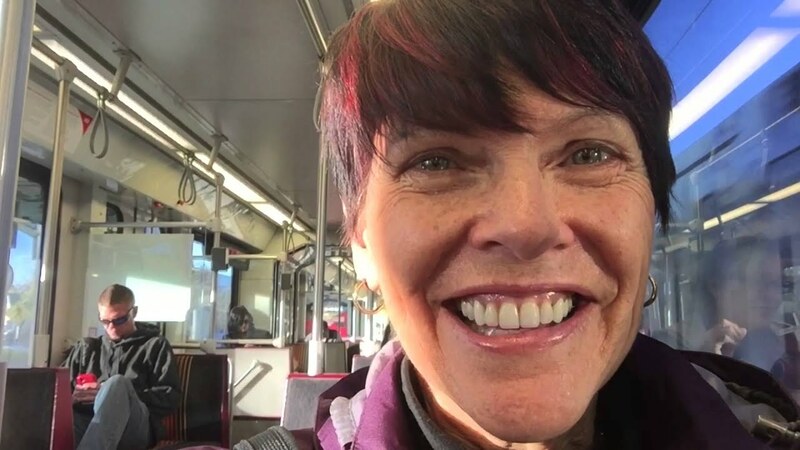 WATCH: The voice of the D Line rides an RTD train to hear her voice - Denverite, the Denver site! May. 01, 2017, 3:00 p.m. The voice of RTD’s D Line is not a robot. It’s a woman with very fine articulation. Her name is Karen Hutton. Hutton is a photographer, California artist and the voice of Canada-based Calgary Transit trains. She recorded the announcements for Denver’s D Line back in 2004. Countless hundreds of thousands of people have heard her disembodied voice aboard commuter trains — but she went a decade without hearing it herself. The Denver Post highlighted Hutton in a feature back in 2006. She was one of eight finalists picked for the original RTD job, and she had to survive an Olympic-style judging panel to get the job. She recorded the D Line voiceover in her home studio, she told the Post. If you’re still reading, I assume you’re weirdly satisfied by train noises, so here’s a recording of that guy playing an organ and saying “hooolllldddd on, please” at Denver International Airport. Oh, and thanks to r/Denver’s IanGecko for surfacing the D Line video.